Download "UPMC for Life HMO Deductible with Rx (HMO) offered by UPMC Health Plan"
2 UPMC for Life HMO Deductible with Rx Annual Notice of Changes for Think About Your Medicare Coverage for Next Year Each fall, Medicare allows you to change your Medicare health and drug coverage during the Annual Enrollment Period. It s important to review your coverage now to make sure it will meet your needs next year. Important things to do: Check the changes to our benefits and costs to see if they affect you. Do the changes affect the services you use? It is important to review benefit and cost changes to make sure they will work for you next year. Look in Sections 1.5 and 1.6 for information about benefit and cost changes for our plan. 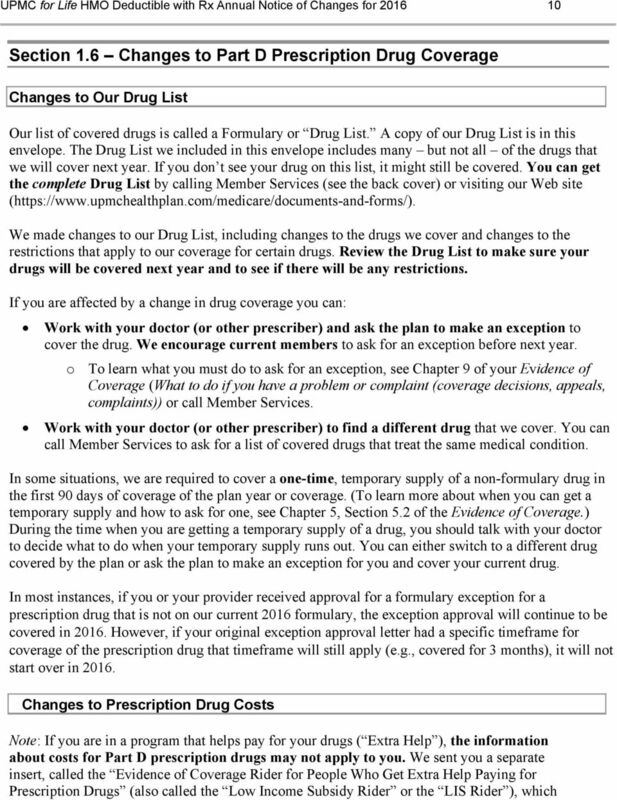 Check the changes to our prescription drug coverage to see if they affect you. Will your drugs be covered? Are they in a different tier? Can you continue to use the same pharmacies? It is important to review the changes to make sure our drug coverage will work for you next year. Look in Section 1.6 for information about changes to our drug coverage. Check to see if your doctors and other providers will be in our network next year. Are your doctors in our network? What about the hospitals or other providers you use? Look in Section 1.3 for information about our Provider Directory. Think about your overall health care costs. How much will you spend out-of-pocket for the services and prescription drugs you use regularly? How much will you spend on your premium? How do the total costs compare to other Medicare coverage options? Think about whether you are happy with our plan. If you decide to stay with UPMC for Life HMO Deductible with Rx: If you want to stay with us next year, it s easy - you don t need to do anything. If you decide to change plans: If you decide other coverage will better meet your needs, you can switch plans between October 15 and December 7. If you enroll in a new plan, your new coverage will begin on January 1, Look in Section 2.2 to learn more about your choices. 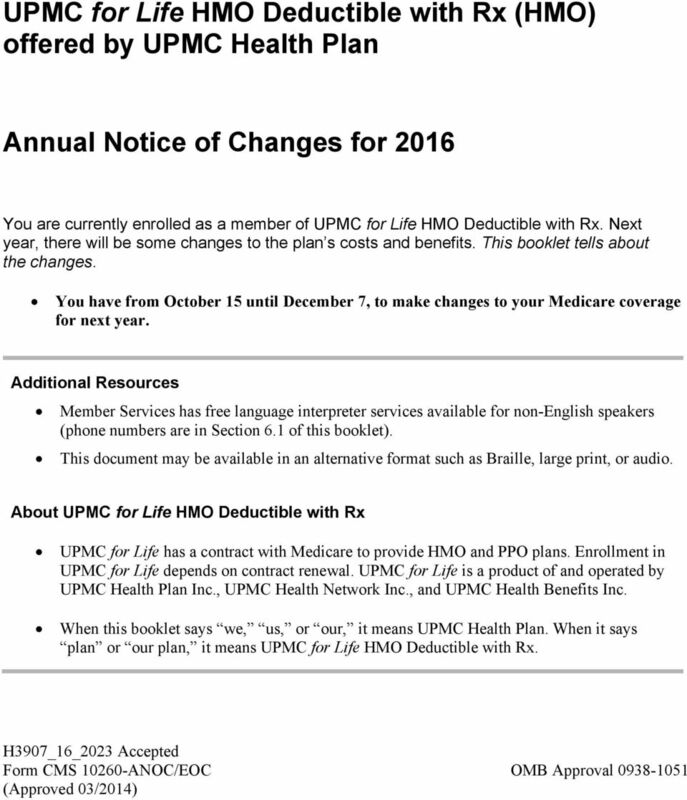 6 UPMC for Life HMO Deductible with Rx Annual Notice of Changes for SECTION 1 Changes to Benefits and Costs for Next Year Section 1.1 Changes to the Monthly Premium Cost 2015 (this year) 2016 (next year) Monthly premium $18 $22 (You must also continue to pay your Medicare Part B premium.) Your monthly plan premium will be more if you are required to pay a late enrollment penalty. If you have a higher income, you may have to pay an additional amount each month directly to the government for your Medicare prescription drug coverage. Your monthly premium will be less if you are receiving Extra Help with your prescription drug costs. 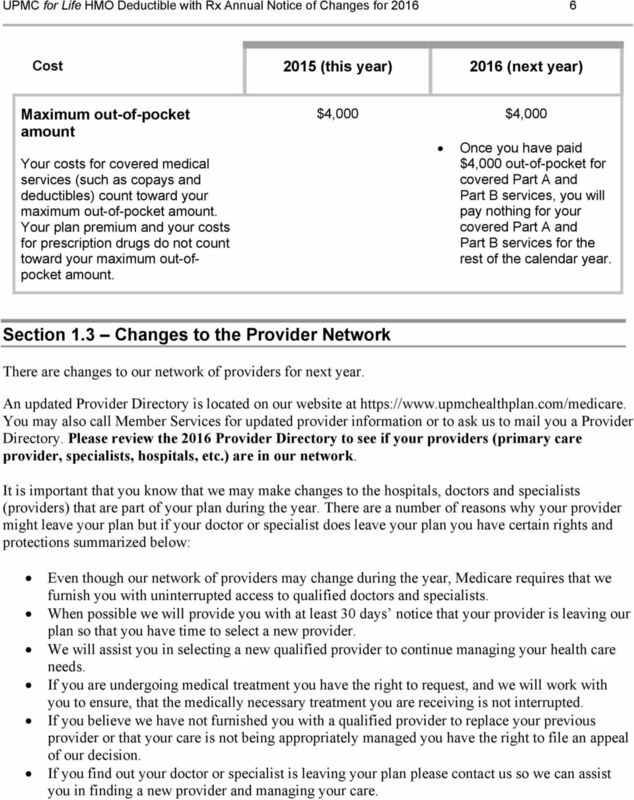 Section 1.2 Changes to Your Maximum Out-of-Pocket Amount To protect you, Medicare requires all health plans to limit how much you pay out-of-pocket during the year. This limit is called the maximum out-of-pocket amount. Once you reach this amount, you generally pay nothing for covered Part A and Part B services for the rest of the year. 7 UPMC for Life HMO Deductible with Rx Annual Notice of Changes for Cost 2015 (this year) 2016 (next year) Maximum out-of-pocket amount Your costs for covered medical services (such as copays and deductibles) count toward your maximum out-of-pocket amount. Your plan premium and your costs for prescription drugs do not count toward your maximum out-ofpocket amount. $4,000 $4,000 Once you have paid $4,000 out-of-pocket for covered Part A and Part B services, you will pay nothing for your covered Part A and Part B services for the rest of the calendar year. Section 1.3 Changes to the Provider Network There are changes to our network of providers for next year. An updated Provider Directory is located on our website at You may also call Member Services for updated provider information or to ask us to mail you a Provider Directory. Please review the 2016 Provider Directory to see if your providers (primary care provider, specialists, hospitals, etc.) are in our network. It is important that you know that we may make changes to the hospitals, doctors and specialists (providers) that are part of your plan during the year. There are a number of reasons why your provider might leave your plan but if your doctor or specialist does leave your plan you have certain rights and protections summarized below: Even though our network of providers may change during the year, Medicare requires that we furnish you with uninterrupted access to qualified doctors and specialists. When possible we will provide you with at least 30 days notice that your provider is leaving our plan so that you have time to select a new provider. We will assist you in selecting a new qualified provider to continue managing your health care needs. If you are undergoing medical treatment you have the right to request, and we will work with you to ensure, that the medically necessary treatment you are receiving is not interrupted. If you believe we have not furnished you with a qualified provider to replace your previous provider or that your care is not being appropriately managed you have the right to file an appeal of our decision. If you find out your doctor or specialist is leaving your plan please contact us so we can assist you in finding a new provider and managing your care. 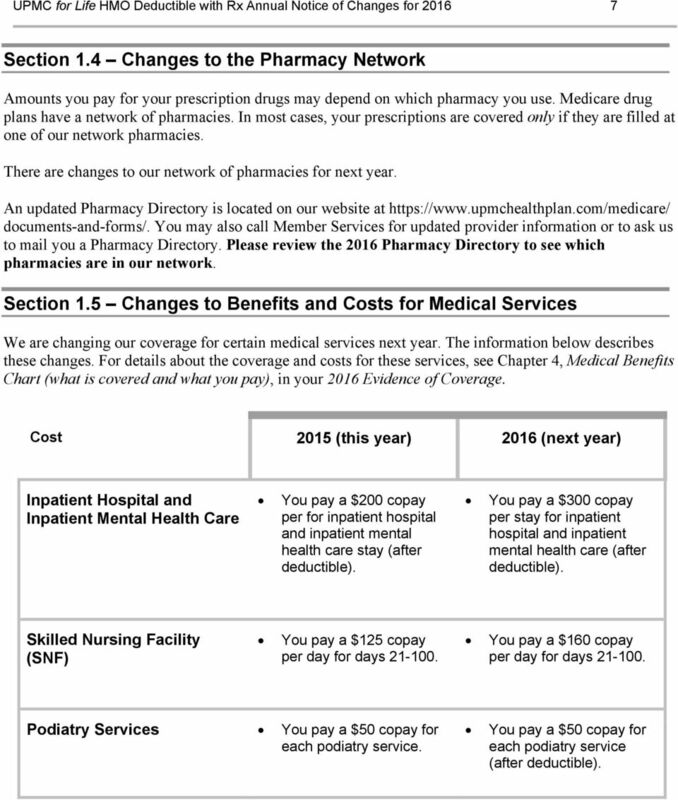 8 UPMC for Life HMO Deductible with Rx Annual Notice of Changes for Section 1.4 Changes to the Pharmacy Network Amounts you pay for your prescription drugs may depend on which pharmacy you use. Medicare drug plans have a network of pharmacies. In most cases, your prescriptions are covered only if they are filled at one of our network pharmacies. There are changes to our network of pharmacies for next year. An updated Pharmacy Directory is located on our website at documents-and-forms/. You may also call Member Services for updated provider information or to ask us to mail you a Pharmacy Directory. Please review the 2016 Pharmacy Directory to see which pharmacies are in our network. Section 1.5 Changes to Benefits and Costs for Medical Services We are changing our coverage for certain medical services next year. The information below describes these changes. For details about the coverage and costs for these services, see Chapter 4, Medical Benefits Chart (what is covered and what you pay), in your 2016 Evidence of Coverage. Cost 2015 (this year) 2016 (next year) Inpatient Hospital and Inpatient Mental Health Care You pay a $200 copay per for inpatient hospital and inpatient mental health care stay (after deductible). You pay a $300 copay per stay for inpatient hospital and inpatient mental health care (after deductible). Skilled Nursing Facility (SNF) You pay a $125 copay per day for days You pay a $160 copay per day for days Podiatry Services You pay a $50 copay for each podiatry service. 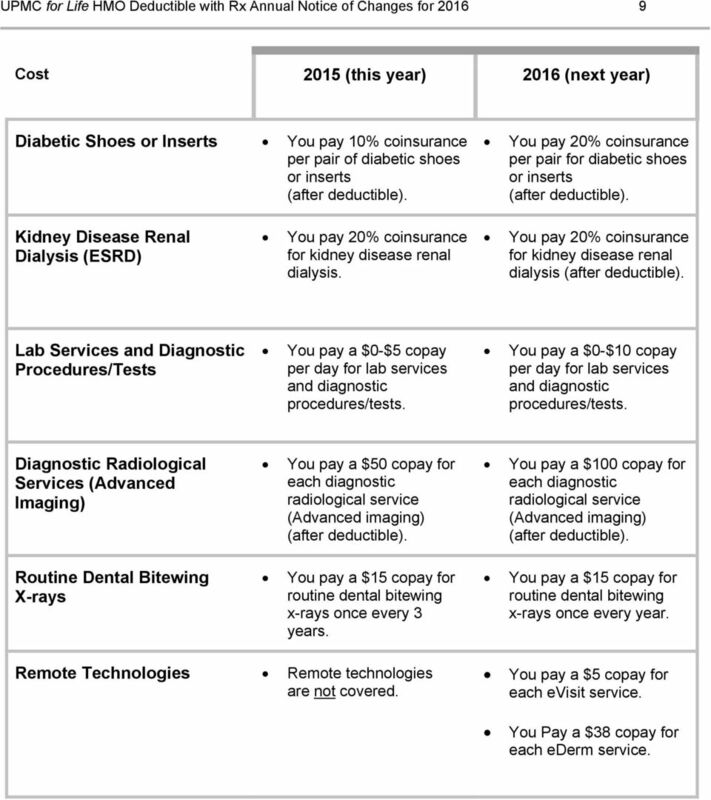 You pay a $50 copay for each podiatry service (after deductible). 9 UPMC for Life HMO Deductible with Rx Annual Notice of Changes for Cost 2015 (this year) 2016 (next year) Outpatient Mental Health You pay a $40 copay for each outpatient mental health visit. You pay a $40 copay for each outpatient mental health visit (after deductible). Outpatient Psychiatric Services You pay a $40 copay for each outpatient psychiatric service. 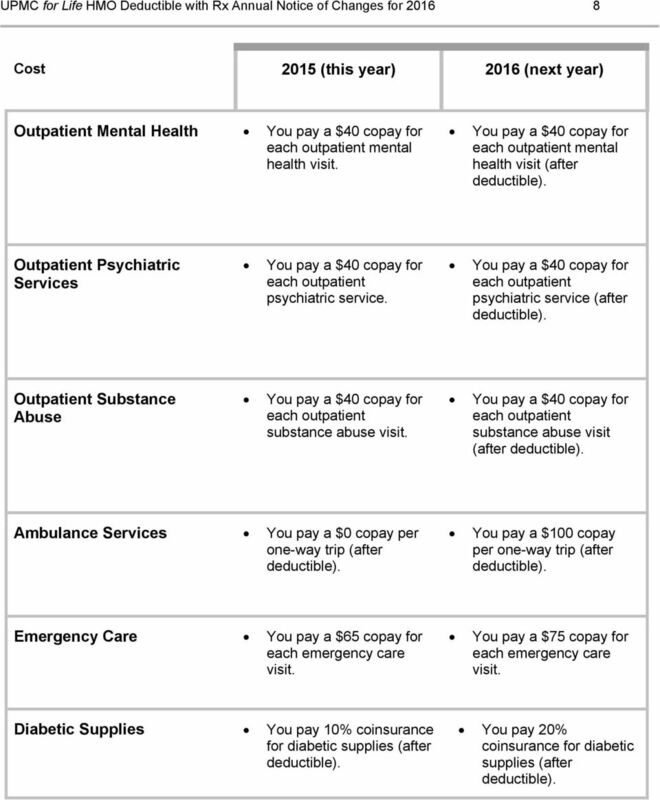 You pay a $40 copay for each outpatient psychiatric service (after deductible). Outpatient Substance Abuse You pay a $40 copay for each outpatient substance abuse visit. You pay a $40 copay for each outpatient substance abuse visit (after deductible). Ambulance Services You pay a $0 copay per one-way trip (after deductible). You pay a $100 copay per one-way trip (after deductible). Emergency Care You pay a $65 copay for each emergency care visit. You pay a $75 copay for each emergency care visit. Diabetic Supplies You pay 10% coinsurance for diabetic supplies (after deductible). You pay 20% coinsurance for diabetic supplies (after deductible). 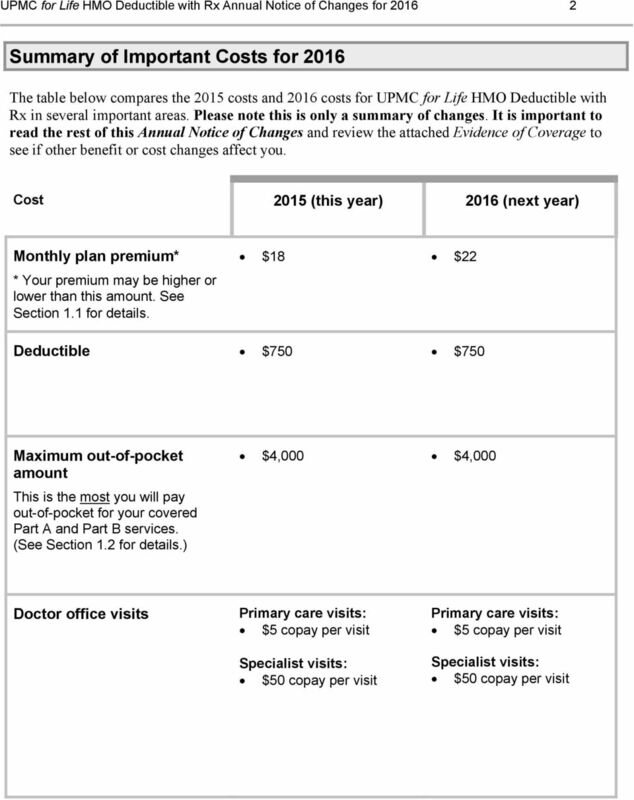 10 UPMC for Life HMO Deductible with Rx Annual Notice of Changes for Cost 2015 (this year) 2016 (next year) Diabetic Shoes or Inserts You pay 10% coinsurance per pair of diabetic shoes or inserts (after deductible). You pay 20% coinsurance per pair for diabetic shoes or inserts (after deductible). Kidney Disease Renal Dialysis (ESRD) You pay 20% coinsurance for kidney disease renal dialysis. You pay 20% coinsurance for kidney disease renal dialysis (after deductible). Lab Services and Diagnostic Procedures/Tests You pay a $0-$5 copay per day for lab services and diagnostic procedures/tests. You pay a $0-$10 copay per day for lab services and diagnostic procedures/tests. Diagnostic Radiological Services (Advanced Imaging) You pay a $50 copay for each diagnostic radiological service (Advanced imaging) (after deductible). You pay a $100 copay for each diagnostic radiological service (Advanced imaging) (after deductible). Routine Dental Bitewing X-rays You pay a $15 copay for routine dental bitewing x-rays once every 3 years. You pay a $15 copay for routine dental bitewing x-rays once every year. Remote Technologies Remote technologies are not covered. You pay a $5 copay for each evisit service. You Pay a $38 copay for each ederm service. 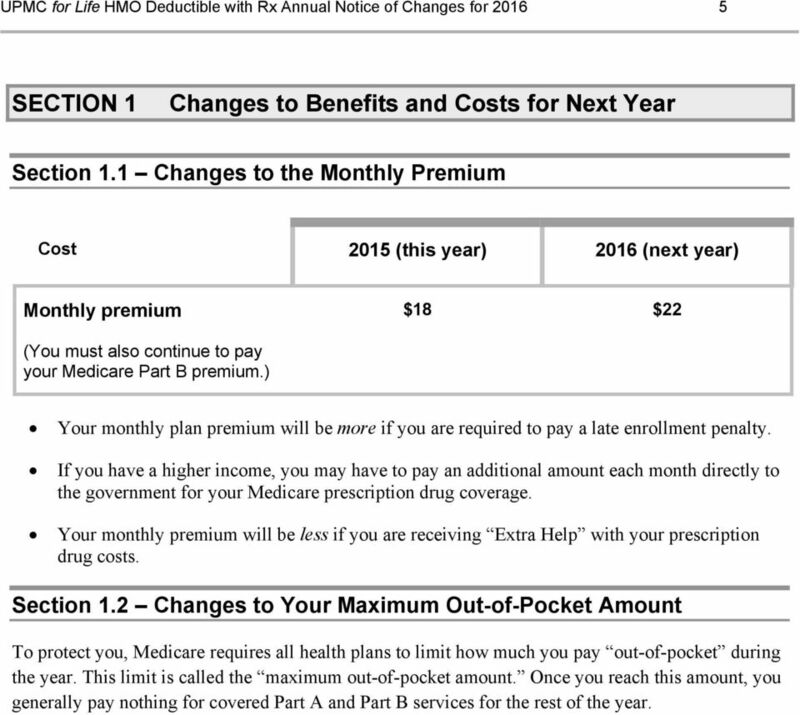 12 UPMC for Life HMO Deductible with Rx Annual Notice of Changes for tells you about your drug costs. If you get Extra Help and haven t received this insert by September 30, please call Member Services and ask for the LIS Rider. Phone numbers for Member Services are in Section 6.1 of this booklet. There are four drug payment stages. 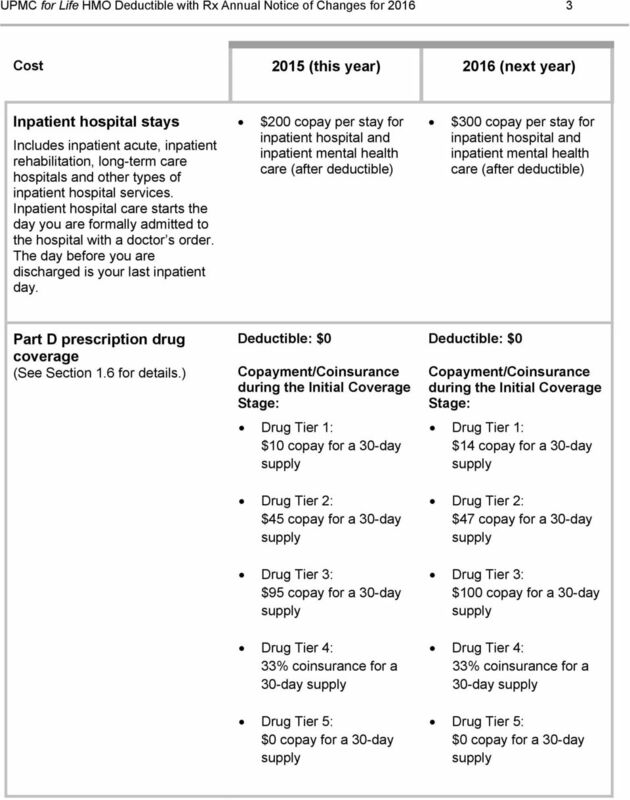 How much you pay for a Part D drug depends on which drug payment stage you are in. (You can look in Chapter 6, Section 2 of your Evidence of Coverage for more information about the stages.) The information below shows the changes for next year to the first two stages the Yearly Deductible Stage and the Initial Coverage Stage. (Most members do not reach the other two stages the Coverage Gap Stage or the Catastrophic Coverage Stage. To get information about your costs in these stages, look at Chapter 6, Sections 6 and 7, in the attached Evidence of Coverage.) 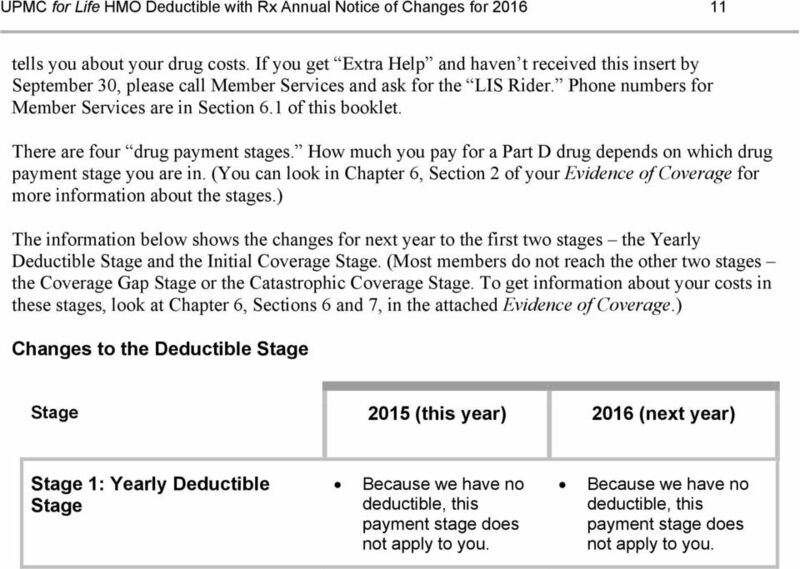 Changes to the Deductible Stage Stage 2015 (this year) 2016 (next year) Stage 1: Yearly Deductible Stage Because we have no deductible, this payment stage does not apply to you. Because we have no deductible, this payment stage does not apply to you. 13 UPMC for Life HMO Deductible with Rx Annual Notice of Changes for Changes to Your Cost-sharing in the Initial Coverage Stage To learn how copayments and coinsurance work, look at Chapter 6, Section 1.2, Types of out-of-pocket costs you may pay for covered drugs in your Evidence of Coverage. 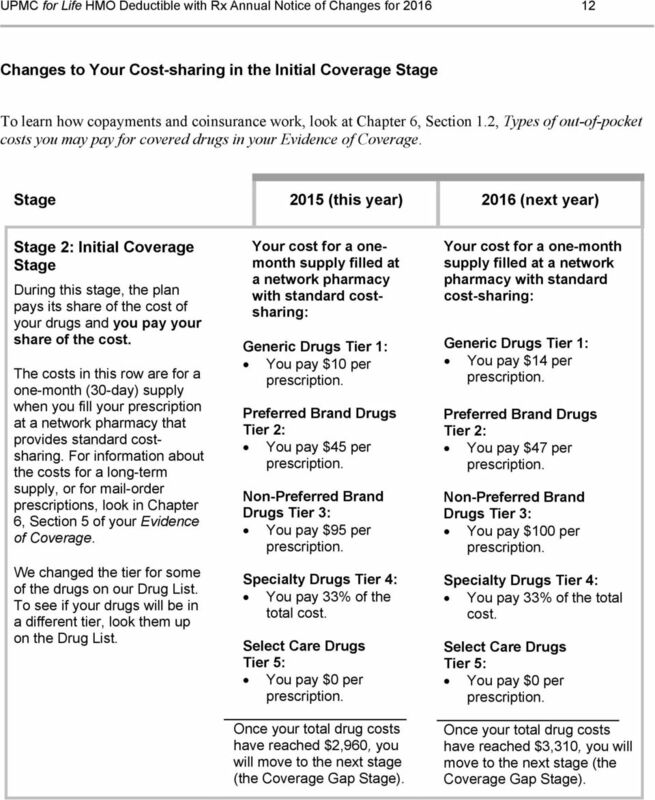 Stage 2015 (this year) 2016 (next year) Stage 2: Initial Coverage Stage During this stage, the plan pays its share of the cost of your drugs and you pay your share of the cost. The costs in this row are for a one-month (30-day) supply when you fill your prescription at a network pharmacy that provides standard costsharing. For information about the costs for a long-term supply, or for mail-order prescriptions, look in Chapter 6, Section 5 of your Evidence of Coverage. We changed the tier for some of the drugs on our Drug List. To see if your drugs will be in a different tier, look them up on the Drug List. Your cost for a onemonth supply filled at a network pharmacy with standard costsharing: Generic Drugs Tier 1: You pay $10 per prescription. Preferred Brand Drugs Tier 2: You pay $45 per prescription. Non-Preferred Brand Drugs Tier 3: You pay $95 per prescription. Specialty Drugs Tier 4: You pay 33% of the total cost. Select Care Drugs Tier 5: You pay $0 per prescription. Once your total drug costs have reached $2,960, you will move to the next stage (the Coverage Gap Stage). Your cost for a one-month supply filled at a network pharmacy with standard cost-sharing: Generic Drugs Tier 1: You pay $14 per prescription. Preferred Brand Drugs Tier 2: You pay $47 per prescription. Non-Preferred Brand Drugs Tier 3: You pay $100 per prescription. Specialty Drugs Tier 4: You pay 33% of the total cost. Select Care Drugs Tier 5: You pay $0 per prescription. Once your total drug costs have reached $3,310, you will move to the next stage (the Coverage Gap Stage). 14 UPMC for Life HMO Deductible with Rx Annual Notice of Changes for Changes to the Coverage Gap and Catastrophic Coverage Stages The other two drug coverage stages the Coverage Gap Stage and the Catastrophic Coverage Stage are for people with high drug costs. Most members do not reach the Coverage Gap Stage or the Catastrophic Coverage Stage. For information about your costs in these stages, look at Chapter 6, Sections 6 and 7, in your Evidence of Coverage. 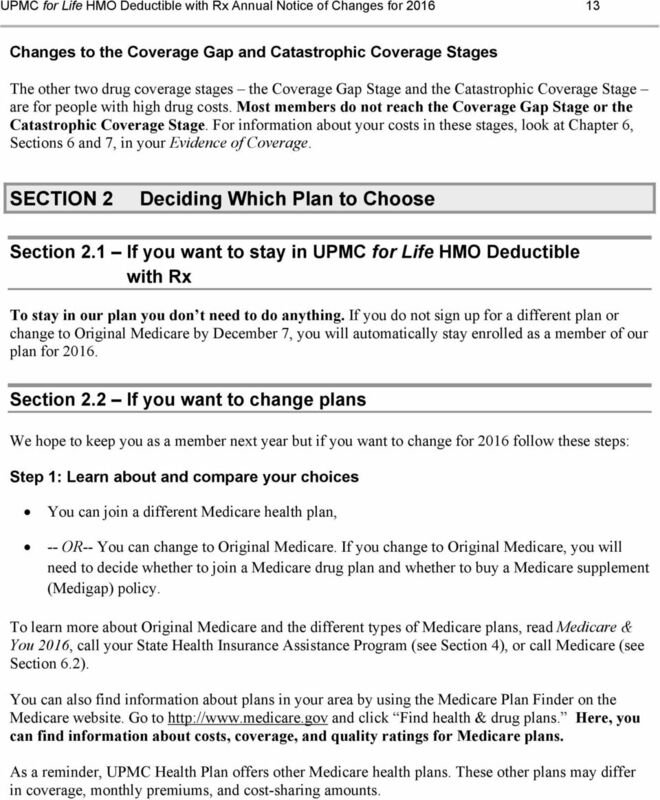 SECTION 2 Deciding Which Plan to Choose Section 2.1 If you want to stay in UPMC for Life HMO Deductible with Rx To stay in our plan you don t need to do anything. 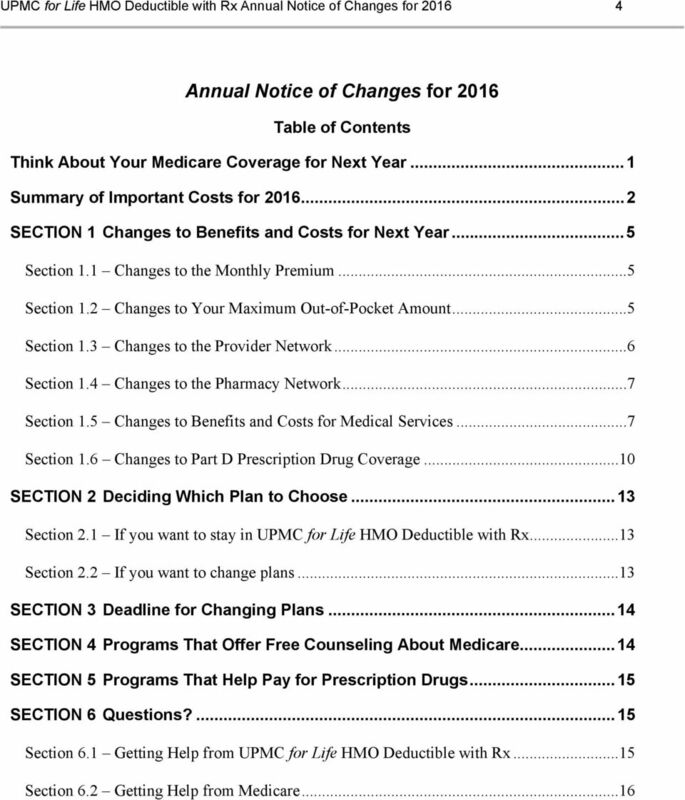 If you do not sign up for a different plan or change to Original Medicare by December 7, you will automatically stay enrolled as a member of our plan for Section 2.2 If you want to change plans We hope to keep you as a member next year but if you want to change for 2016 follow these steps: Step 1: Learn about and compare your choices You can join a different Medicare health plan, -- OR-- You can change to Original Medicare. If you change to Original Medicare, you will need to decide whether to join a Medicare drug plan and whether to buy a Medicare supplement (Medigap) policy. 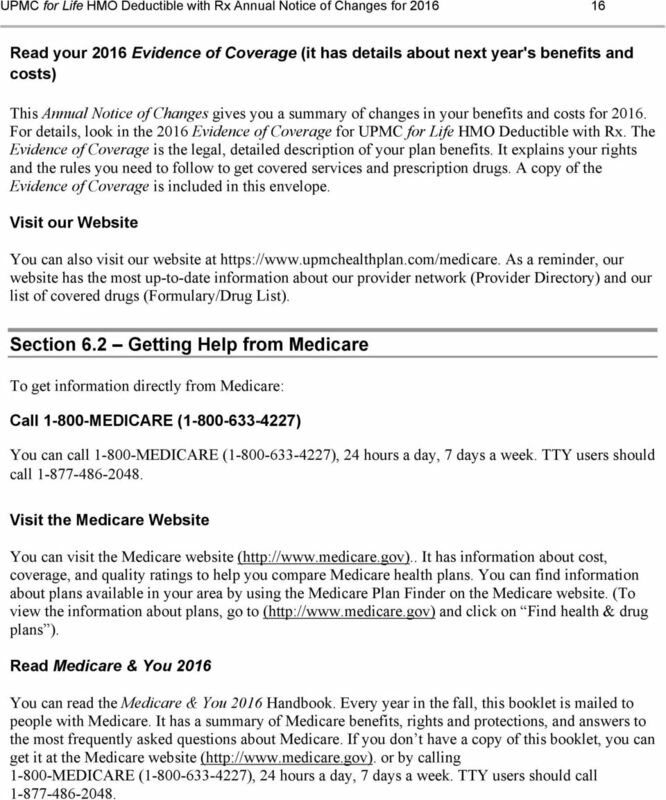 To learn more about Original Medicare and the different types of Medicare plans, read Medicare & You 2016, call your State Health Insurance Assistance Program (see Section 4), or call Medicare (see Section 6.2). You can also find information about plans in your area by using the Medicare Plan Finder on the Medicare website. Go to and click Find health & drug plans. Here, you can find information about costs, coverage, and quality ratings for Medicare plans. 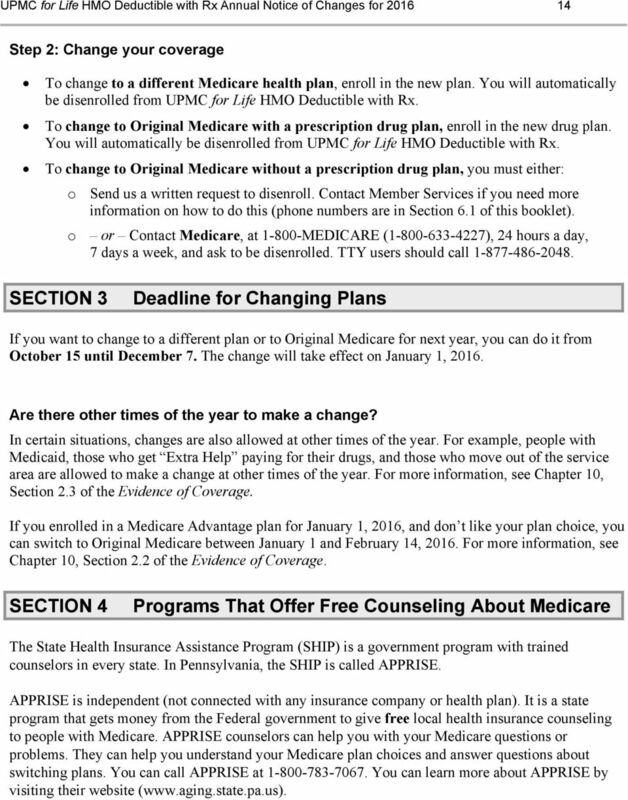 As a reminder, UPMC Health Plan offers other Medicare health plans. These other plans may differ in coverage, monthly premiums, and cost-sharing amounts. 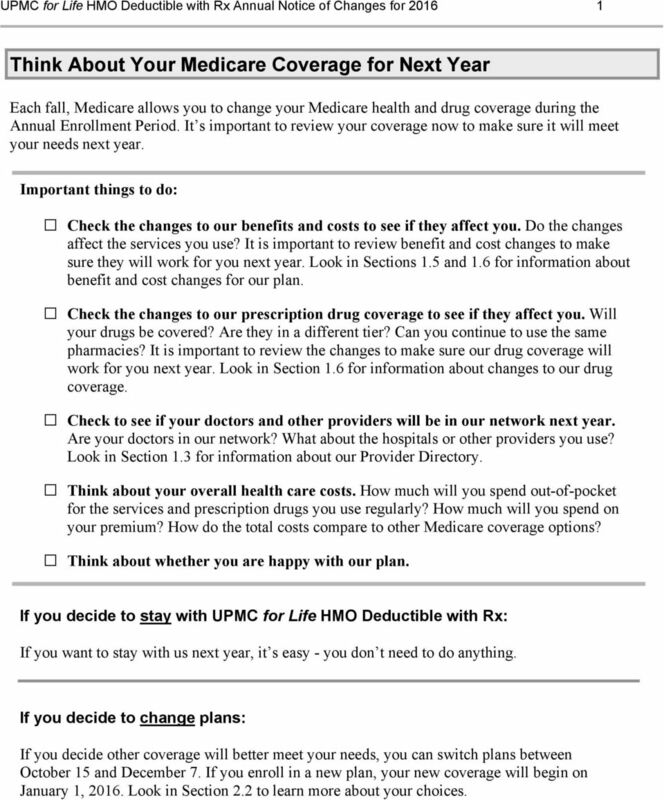 16 UPMC for Life HMO Deductible with Rx Annual Notice of Changes for SECTION 5 Programs That Help Pay for Prescription Drugs You may qualify for help paying for prescription drugs. Below we list different kinds of help: Extra Help from Medicare. People with limited incomes may qualify for Extra Help to pay for their prescription drug costs. If you qualify, Medicare could pay up to 75% or more of your drug costs including monthly prescription drug premiums, annual deductibles, and coinsurance. Additionally, those who qualify will not have a coverage gap or late enrollment penalty. Many people are eligible and don t even know it. To see if you qualify, call: o MEDICARE ( ). TTY users should call , 24 hours a day/7 days a week; o The Social Security Office at between 7 a.m. and 7 p.m., Monday through Friday. TTY users should call, (applications); or o Your State Medicaid Office (applications); Help from your state s pharmaceutical assistance program. Pennsylvania has a program called PACE/PACENET that helps people pay for prescription drugs based on their financial need, age, or medical condition. To learn more about the program, check with your State Health Insurance Assistance Program (the name and phone numbers for this organization are in Section 4 of this booklet). SECTION 6 Questions? 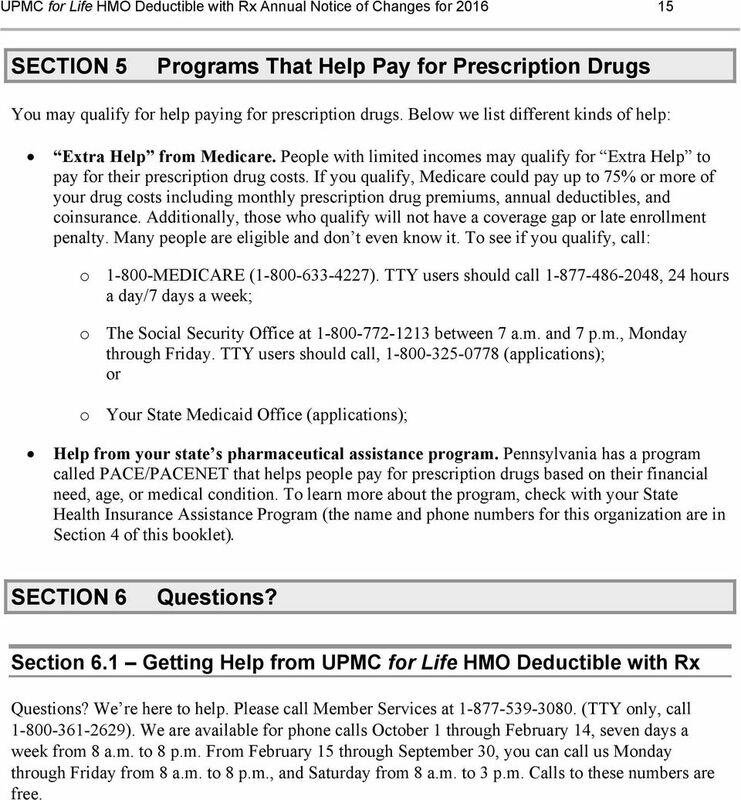 Section 6.1 Getting Help from UPMC for Life HMO Deductible with Rx Questions? We re here to help. Please call Member Services at (TTY only, call ). We are available for phone calls October 1 through February 14, seven days a week from 8 a.m. to 8 p.m. From February 15 through September 30, you can call us Monday through Friday from 8 a.m. to 8 p.m., and Saturday from 8 a.m. to 3 p.m. Calls to these numbers are free.